Top sources indicate the Indian Navy and Indian Coast Guard have asked for technical briefings on the V-22 Osprey tilt-rotor aircraft from Bell and Boeing. The Indian military has been impressed by the demonstrated capabilities of V-22, but has so far stopped short of expressing any overt interest in considering a purchase, despite feelers from Boeing. Boeing conducted a second level of detail presentation to the Indian military establishment (first the Navy) in 2013 on one of the most remarkable — but also controversial — aircraft ever built. Sources reveal that following a request by an Indian delegation at the Dubai Air Show in 2014, Boeing made its official V-22 pitch for India. 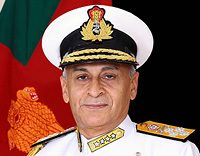 The navy announced its interest in acquiring a fixed-wing AEW platform for its aircraft carriers (first the INS Vikramaditya, then the two indigenous aircraft carriers). While Northrop-Grumman has pitched the E-2 Hawkeye for nearly a decade now, the navy is understood to be intrigued by the flexibility being offered by the V-22. 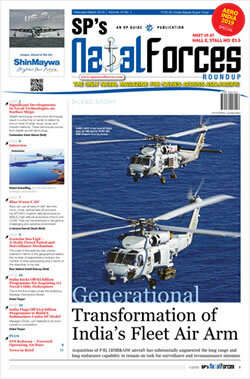 With vertical take off and transition into fixed wing flight, it appears to take care of both the navy's big quandaries in such a qualitative requirement. Fixed wing flight provides much greater range and speed, while vertical launch and recovery precludes the requirement of a catapult launcher (under consideration for the second indigenous aircraft carrier). In the first presentation that Boeing made to the navy on the V-22 (which was more for troop lift operations as part of the marine brigade concept with the Army), it showed slides demonstrating that the aircraft's wings could rotate to align with the fuselage, with the engine nacelles upright and rotors folded back to save space on a crowded carrier deck. Be that as it may, the Osprey is still a large aircraft, and the navy will have to study other parameters before looking any further. It is to be expected that the Osprey will also be pitched at the paramilitary forces, IAF, the CoastGuard and Army for various other requirements. 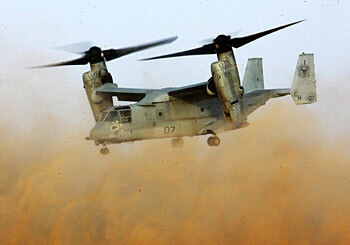 For the flexible operations approach, the V-22 may play an important role.